Lucy Martin is currently appearing in the smash-hit musical Jersey Boys in London’s West End. During Act 1 she plays a number of roles including a French pop star, Frankie’s mother, and a prostitute. In the second half of the show she plays the role of Frankie Valli’s girlfriend Lorraine. 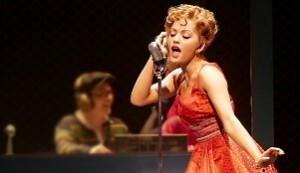 Lucy recently answered some questions about herself and being in the cast of Jersey Boys. How old were you when you realised you enjoyed performing in front of others? I wouldn’t be able to say! From a very young age, ever since I can remember I was always standing somewhere with a microphone pretending I was Britney Spears or making family and friends watch my latest show, dance or favourite song. Was there anyone in particular who inspired you to want to be on the stage? Originally, no not really. Now I look at actresses such as Kate Winslet, Julia Roberts and classic Marilyn Monroe. And dream, ha ha. But I would say I get inspired from people outside the industry, I find more inspiration to do what I do from other aspects of life. You had a scholarship at Tring Park for Performing Arts. How much pressure did you feel having a scholarship? If you could choose one favourite memory from your training, what would it be? I can’t think of an answer that I would write down for people to read about me, but I do have a favourite memory from when I first auditioned for Tring Park. I had found the place while searching on the internet, and printed off the application forms and showed my mum and dad. They obviously looked into the costs etc and thought that there is no way we would be able to gather up enough funds for me to go there. But, they decided that all experiences were good ones. So we sent off the application anyway. I vividly remember getting out of the car with my mum looking up at the Rothschild Mansion (completely overwhelmed) both of us nervously laughing and my mum saying to me “Enjoy this audition Luce, because we’re not coming back here again”. Ha Ha! Little did we know. What was your first professional stage role? I did an open audition for Dirty Dancing when I was 16, I saw it advertised in The Stage ‘looking for dancers preferably with experience in Ballroom and Latin’ (I started Ballroom and Latin American dancing at 14 and competed at Junior Level, and then became a part of a Latin American Formation Team becoming British champions and representing the UK in the World Championships in Germany and Austria at Junior and Youth Level). So because of this I got convinced by some friends of mine to go along, just for the experience. Well, I turned up at dance works with my mum and a little biography-type CV and a non-professional headshot (it makes me cringe to say it was my Facebook profile picture). I had to print it off at reception because I didn’t know I needed a headshot (haha totally clueless). Thinking about it now is hilarious. There were so many people there. I remember I was in group G and it went all the way to L of the alphabet. But to cut a long story short I ended up being recalled and did eight or nine auditions overall. I got down to the finals and then heard nothing. I ended up getting into a bit of trouble at Tring for obviously going and not telling anyone, but I had no idea I would end up getting to the finals! I went back to school for my second year and just knuckled down and worked my socks off. Having turned 17 in the summer I got a voicemail from the casting director for Dirty Dancing asking me if I would come back to audition for them, and that they would love to see me and they promised they wouldn’t make me do as many auditions this time. So I did two auditions, got offered swing and understudied Penny and Lisa. I loved both roles. They are completely different characters. I had such fun playing Lisa. She was the comical role and a lot of fun completely in her own world, whereas Penny was obviously older and very down-to-earth. It was great to be able to have the chance to become both characters and take on different roles and challenge myself. Penny of course had brilliant partner-work dancing which I loved. Penny was one of my dream roles. You performed in the international tour of Mamma Mia! understudying and playing the role of Ali. What can you tell us about being on tour and the show? Mamma Mia! is a great feel-good show. It’s very uplifting and I’m a lover of ABBA music so there was no problem there. Being on a tour is very much like having a second family because you are with each other 24/7. I loved going to different countries and exploring. I think my favourite thing about the job was that you had the chance to live in different countries. Travelling, but also doing what you love, and getting paid of course. You are currently playing the role of Lorraine in Jersey Boys at the Prince Edward Theatre. What can you tell us about your character and how she fits into the storyline? I play many parts in the first act from being a French pop star, Frankie’s mother to playing a prostitute. I have something like 13 different characters in Act 1. There are so many wig and costume changes. Act 2 is where Lorraine comes into the story Line. Lorraine is Frankie Valli’s girlfriend. She is a news reporter, writing an article on ‘The Four Seasons’ which is where she meets Frankie. She is a confident young lady, from an upper class family and is a new generation of the working woman. Their relationship is quite a sad one really, one that should work out, but in the end even though they are very much in love and she loves Frankie dearly she knows that the band will always come first. Tommy DeVito and Frankie’s relationship, the Jersey Boys’ loyalty, means that no matter what she will always be second best. So it’s a sad situation of knowing that she deserves better, and therefore has to leave him. I think for the story line of Frankie Valli, it’s a turning point for the audience to understand just how being a Jersey Boy comes above everything else including their own happiness. What is your favourite scene and song in the show? My favourite scene is Lorraine’s ‘packing scene’ in Act 2 and maybe ‘Oh what a night’ when I play the prostitute in the red dress – that’s always fun haha. ‘Working my way back to you’ is also one of my favourite songs in the show. How does the music from Jersey Boys fit in to your own personal taste in music? I love the music in the show! When I first watched the show I was amazed at all the songs that I knew and loved, but had no idea that they were originally written by them. In ten years’ time, where do you want to be in your career? I want the world! I am, at the moment, working on getting into TV and film. I’ve really enjoyed being in an acting-based musical. I think Jersey Boys is more of a play with music. I’m one of those people who like to dabble in every part of the industry, whether it’s acting, dancing or singing. I love a challenge. But I find it exciting not knowing what’s going to happen next. In ten-years time, that’s a long way away, but hopefully I’ll be in Hollywood movies by then, but who knows. One can only dream. My general goal is to be the best I can be in whatever life throws at me and I’ll put my all into whatever challenge confronts me. I spend quite a lot of time running, it’s the best way of bringing my stress levels down, and clearing my head. I spend a lot of time going back to my family in Knowle (at least once every two weeks), I’m very close with my family – it’s like my little getaway. I’m very interested in fashion and designing so at some point I would love to maybe do something in that world. I enjoy drawing and painting and finding exhibitions to go to and look around. Why should everyone come along to see Jersey Boys? Because it’s a fantastic show, and has something to offer to all generations. Unlike other jukebox musicals it not only features their catalogue of music but also tells the true story of the band and its artists. You’ll come away humming the songs for weeks. Any message to those following your career? Book tickets for Jersey Boys!